Tjampuhan Hotel is a classic, traditional Bali hotel with a long, illustrious history claiming to be the first hotel in the artist colony of Ubud. 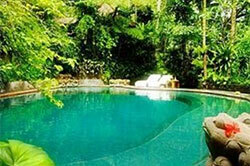 The Tjampuhan Hotel is located just a short walk (or shuttle bus ride) to center of Ubud and set atop a ridge overlooking a beautiful tropical river ravine. 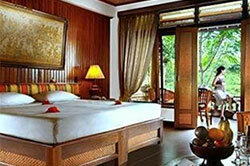 The hotel is elegantly decorated in gorgeous Balinese decor with lovely art pieces and handsome wood and stone carvings. There are winding pathways with abundant lush, tropical plants dotting the way to the large pool, unique spa and attractive, antique restaurant. The spa is very rustic and interesting and features both hot and cold spring-fed Jacuzzi pools and a variety of massage and beauty treatments nestled in a private cavernous cove.